Ex hire/training laser sealed bid auction. By order of RSC committee, club lasers nos. 2, 4 and 5 are to be sold as complete boats, consisting of hull, foils , spars, a full size sail, plus a cover and launch trolley. These boats are to be sold on an “as seen” basis, with no warranty implied or given. The hulls and spars may be inspected at any time in the boat park. Sails and foils may be seen when a committee member is on hand i.e. Sunday, Wednesday and Thursday sailing sessions. · In the event of two identical highest bids the winners will be drawn from a hat. Laser No………… My Highest Bid…..£…………………………. Please put your bid in the box in club house, thanks and good luck. Excuses were aplenty for the fifth race in the series. Bob was suffering from a dickie stomach so took a chance to fix his boat, Tracey wasn’t up in time to start the race, but turned up to sticker her boats, and there was no sign at all of Monica or Mark. 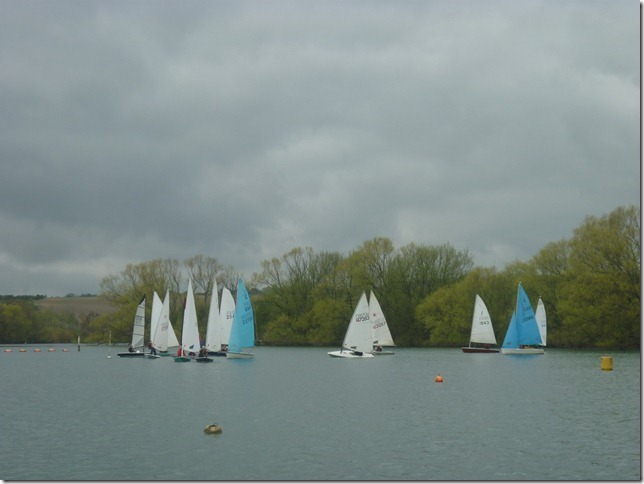 Still, there were 18 boats who braved the cold wind – much windier than forecast. Dave P was feeling a bit delicate, so opted for a Radial rig but for the braver souls, there was a chance to make good use of spinnakers. There was excitement at buoy 1 when Adrian ditched the new Vago, and kept the rescue crew busy as they tried to pull his mast out of the mud. Hugh managed to stay out in the front for an hour before being caught by the lasers. Steve started well but got tangled up with the 505 when he tried to lap it. The Jolly Sailor couldn’t quite see the finish, but thinks it was Chris followed by David in his laser. The race went on a bit longer than 90 minutes for some of the sailors as they didn’t hear the hooter and cruised around like spare parts at a wedding waiting for the comittee boat to give them their finishing place. Alas they never came. Perhaps the 505 is still out there ! Wow, on a cold, wet and sometimes windy evening, some 26 children arrived to have an hour of fun and frolics on and in the water – bad luck Izzy on your capsize – under the watchful eyes of Gary, Paul and Ollie in the power boats. After the usual briefing from Gary by ‘the log’ – the youngsters paired off in two’s and three’s to take to the water, by 18:45. There were 2 Oppies, 2 Picos and 9 Toppers. What a colourful sight for all the Mums and Dads, safely watching from the deck or inside the clubhouse – a very chilly evening…..
Gary was impressed by the triangular course that the entire fleet managed to keep up for a couple of laps – out to 7 across to 6 and back towards the jetty. There were hoops to throw and retrieve, and as the wind dropped the fleet rafted together and made an attempt to sail the whole fleet in a line across the lake. 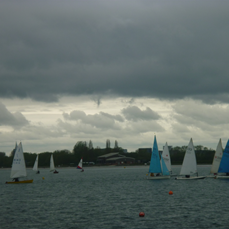 The rain came in, the parents huddled under cover, but the fleet kept afloat……getting very, very wet all the while….. The wind came up and the boats broke away from each other having fantastic free sailing – changing boats, laughing and having unrestricted fun playing chase. There was also some interesting sailing from the front of the boat by Olly. As the sailors became cold, there was a lap of the course as ‘stand up’ sailors saluting the commodore upon passing the clubhouse!!! We think he was busy ‘feeding his face’…?? Without too much chasing, the fleet returned to shore for 19:45 and, with fantastic help from parents and other members, the boats were stowed away and all were in the club for 20:00, for hot chocolate, a large piece of Craig’s birthday cake and a loud rendition of ‘Happy Birthday’. By 0930 there was lots of activity in the boat park on a gorgeous cold but sunny morning…but the wind was set to increase…so said metcheck…. Colin and his team had a very busy morning, setting a slalom course from Tektona, using most of the bouys on the lake. The first away was Ryan in his Oppie, followed by Hugh in his Topper – an ‘official’ complaint came from these young men, that the course wasn’t radioed back to the shore before they took to the water…! 26 boats started, with only 17 completing the first lap!! Some unfortuantes had their first swim before they got to the start line. Sylvia eventually started, having had to return to the shore to secure her out haul. Adrian braved the strong gusty wind and took out his Vago, only to have his kite sheet jam, capsized and had to be towed out of the reeds back to the shore. Newton was looking great, spinnaker flying until his crew Ros fell overboard…is this more man over board practice we wonder?? The Laser ‘louts’ were positively flying around the lake between swims!! Peter with a 4.7 sail manage to survive 88 mins before he succumed to the icey water….there was a lot of sail washing to do…Steve wisely went for a Laser, instead of sailing the 505 single handed…..Lynne had taken one look at the wind and decided cooking was her mission for Sunday morning….good choice Lynne!! Young Dan, after his upteenth capsized came in, deciding that cotton shorts with positively blue legs beneath were not the ‘dress’ of the day!! Big Paul looked positively glowing on his return to the shore…perhaps he had stayed upright for the 90 mins?? The less foolhardy/geriatric sailors, namely Dean, Chris and Monica, preferred to watch the race from the club deck, hot coffee in hands…..there was plenty of action at buoy 7….Mike capsized, righted himself, sailed backwards and briefly ‘camped’ out on the mark, causing a little mayhem for the boats following him……nice one Mike! While Bob and Sylvia both capsized spectacularly on the last lap at 7, as a fierce gust swept down the lake, much to the spectatores delight. The 2 Bills popped down for a look at the fun on the water…while the leading boats, between baths, kept going/flying for the full 90 mins. Everyone came ashore exhausted including the OOD team….someone was heard to say she did not have the energy to turn on a light switch!! It looked as if about 12 boats finished the course, with David 1st, Roland 2nd, 3rd Jon……to be confirmed on the results page. You are invited to view Tracey’s album. This album has 5 files. Another great Pink Day, despite the chilly wind, with Monica returning from her ‘care home……’we don’t know how she puts up with Ken…!! We were 19 racers who were ably started from Tektona, by Ken and Monica, a 1st for the Pinkies, and all were well positioined on the start line…except for Maurice, struggling a bit in a club Pico ……but with a little help from Ken, he managed the hour long race, and was awarded the much sort after Pink Fleet cup, for his efforts. Well done Maurice! Before we took to the water, we were well fortified by Paul and Barbara’s usual delicious breakfast – many thanks. Of course there were the usual disqualifications, notably Ricardo, freshly returned from Italy sporting a new hair ‘do.’ Nice one Ricardo! And there were plenty of familiar Pinkies…good to see you Mike….great to see Tracey, Amy, Craig and Hugh in his Topper, going well. Robbie and Pat, in their Mirrors and of course Alice in her Laser, with the ‘designer’ sail…Lousie took the family’s Comet leaving poor Richard with the Toppper…bad luck Richard. Everyone enjoyed the day, even little Affie, sporting her fuschia pink outfit…..many thanks to everyone who came, sailed and had fun…RSC style…..see you all next month, when the Pirates will join the fun after lunch. Loads of people turned out to help get things straight for Spring. With forty odd helpers we managed to put up a trailer compound, clean up the clubhouse and Tektona, fill some of the bumps in the boat park and the new car parking area, as well as all those on going maintenance jobs. Well done to all who helped out, and thanks to Elaine for keeping us supplied with tea and coffee. Neither Rome nor RSC was built in a day so see you all next month. Thanks. You are invited to view dave’s album. This album has 4 files. The Bank Holiday Monday leg of the Easter Cup was a stark contrast to Sunday’s gentle drifter. A nice stiff Force 3 put helm’s through their paces with Chris and Newton showing good form , and Ian hanging on well. Results will be posted in the usual place. You are invited to view dave’s album. This album has 3 files. This album has 2 photos and will be available on SkyDrive until 09/07/2012. 18 boats took to the water to fight out for the Easter Cup. The wind seemed fairly steady for race coming from the west. The first mark was quite tight with the whole fleet battling to get round it first. David took for honours with Steve a close second. This was the case for the whole race. Roger was seen rigging his boat , didn’t his alarm go off or was he making sure he had plenty of time for the 2nd race. Only he would know. It was good to see Newton s son crewing for him. We hope to see him more in the future. The following race was had the same course but 2 boats dropped out. Ian had a great start and opened up a commanding lead. He was get clear air and pulled away from the fleet. Steve and David battled out for 2nd and 3rd. The finishing positions were as follows 1st Ian 2nd David 3rd Ian.